Welcome your family home to the aroma of home-baked bread. 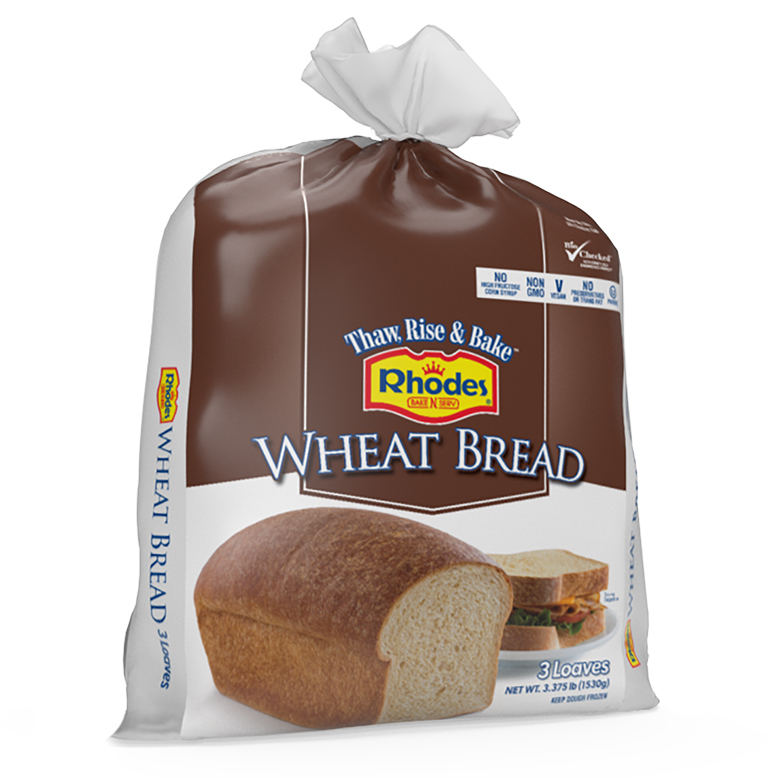 Rhodes Bake-N-Serv® Wheat Bread is made from high-quality ingredients and is a great source of fiber. 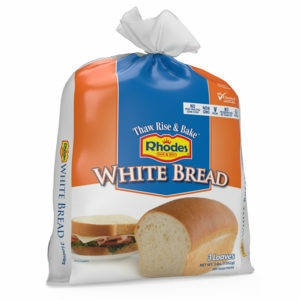 Wheat Bread is available in packages of 3 loaves. 1. Coat a loaf pan with non-stick cooking spray. 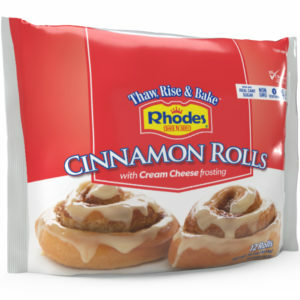 Place frozen dough in pan, and cover with plastic wrap coated with cooking spray to keep it from sticking to dough while rising. 2. Let dough rise for 4 to 7 hours, until dough is 1” above pan. Actual time depends on the temperature of your kitchen. Carefully remove the plastic wrap. 3. Preheat the oven to 350F. Bake bread 20-25 minutes, until golden brown. 4. Remove bread from pan at once and place on a wire rack to cool. Brush the top with melted butter or margarine, if desired. Place bread on its side for easier slicing. 2. 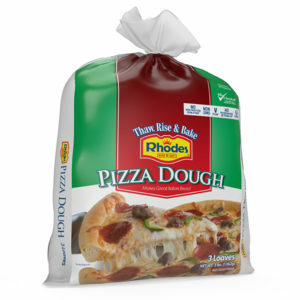 Place frozen dough in your refrigerator 6 to 12 hours before using. 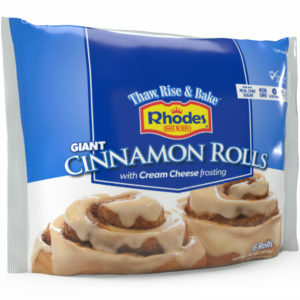 Dough will not rise, but will be thawed and ready to use. Set dough out to rise for 2 to 3 hours, until dough is 1” above pan. Actual time depends on the temperature of your kitchen. Carefully remove the plastic wrap. 3. Preheat the oven to 350°F. Bake bread 20-25 minutes, until golden brown. 1. Coat a loaf pan with non-stick cooking spray. Place frozen dough in pan. Do not cover. Preheat oven to 200°F, then turn oven off. 2. Boil 1 to 2 quarts water. Pour water into shallow pan placed on lowest oven rack. Place dough in warm, moist oven. Let dough rise 2 to 4 hours, until dough is 1” above pan. Check every 20 minutes after first hour to make sure dough does not rise too high. Remove pan of water and bread. 3. Preheat oven to 350°F. Return bread to oven. Bake 20-25 minutes, until golden brown. Convection Oven: Lower baking temperature to 325°F. Bake bread 20-25 minutes. *Speed Method Thaw may make bread less smooth on top. Flavor is unaffected. Best appearance is achieved using the Regular Method. 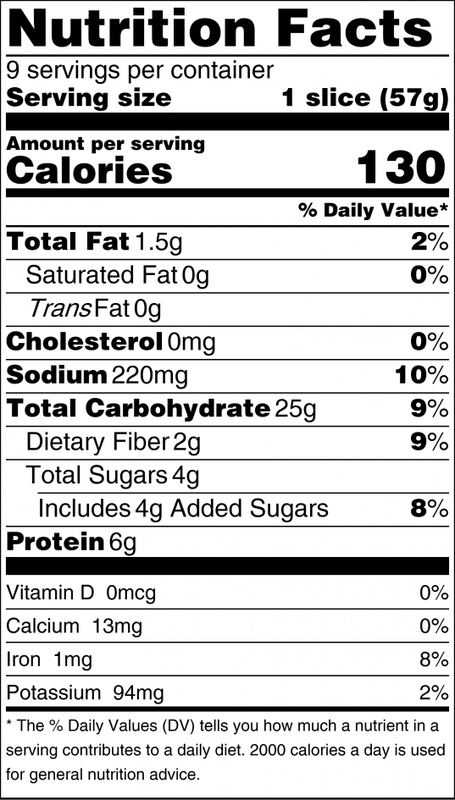 INGREDIENTS: Whole wheat flour, water, unbleached white flour, granulated sugar, yeast, wheat gluten, soybean and/or canola oil, salt, sodium stearoyl lactylate, yeast nutrients (calcium sulfate, ammonium chloride), ascorbic acid, enzyme (added for improved baking).